In all cases………Make sure the problem is in the rotor, and not in the controller box or cable before proceeding! See below. Take resistance readings and compare with specs in instruction book. If your problem is the directional pot inside the rotor, my document is for you as a guide. Suggest taking photos or video along each step of the disassembly process. I.Testing…. Checked the rotor cable via VOM from end to end, including the plugs; ok. Before removing from the tower, mark one side of the lower rotor case to correspond with your mark on the rotor mounting plate to help in putting the rotor back in the tower. Rotor must be on a tower rotor plate, and I recommend using the Yaesu GA-3000 “Tower torque absorber” under the rotor and on the plate. II. Control Box……… Opened the control box and did not find any discolored parts and the output voltages appeared normal on both directions of turning and the highest speed setting showed in the range of 10VDC and up; on specs and ok. Remove two upper rear both-side screws and the row of three screws across the front bottom IF you want to look inside the control box. a) Remove the upper mast bracket/clamp pair completely off the rotor body with four bolts that screw into the top of the rotor body using threaded holes for these bolts. Set aside. b) The rotor body, which I will call a “clam shell” because there are two pieces, upper and lower (plus the circular fixture that receives the bolts), hold the motor and the turning sensing and end-stop features; i.e. the whole rotor. c) Using a dab of paint or marked masking tape, mark the upper clam, the circular fixture that receives the bolts, AND the lower clam shell so that all THREE can go back together the same way. d) Take a photo of the markings. e) The rotor body should be PLACED INSIDE A TUB* or large bowl and placed bottom up (later, the inside fixtures you want to see are facing upward inside the lower clam shell). If you do not use a tub* the ball bearings can escape their placement in their races and disburse all over your work table and floor! f) Unscrew the six bolts that range around the outside of the clam shells, HOLD THE THREE PARTS TOGETHER—THE CIRCULAR RING WHICH HOLDS BALL BEARINGS, AND BOTH CLAM SHELLS–FIRMLY HOLD BY HAND THESE THREE PARTS TOGETHER, even after you have removed all the six bolts. Note if working alone…Using masking tape or duct tape strips to replace the function of the six bolts (and your helper’s hands) that hold the clam shells together. That is to aid in holding the clam shells together after the six bolts are removed. Otherwise, the whole assembly comes apart without adequate seeing how to reassemble. g) Holding the three parts tightly in place by hands or strong tape, turn the rotor over so that it is oriented UP (upper clam shell is labeled “Top Side” in English and Japanese). 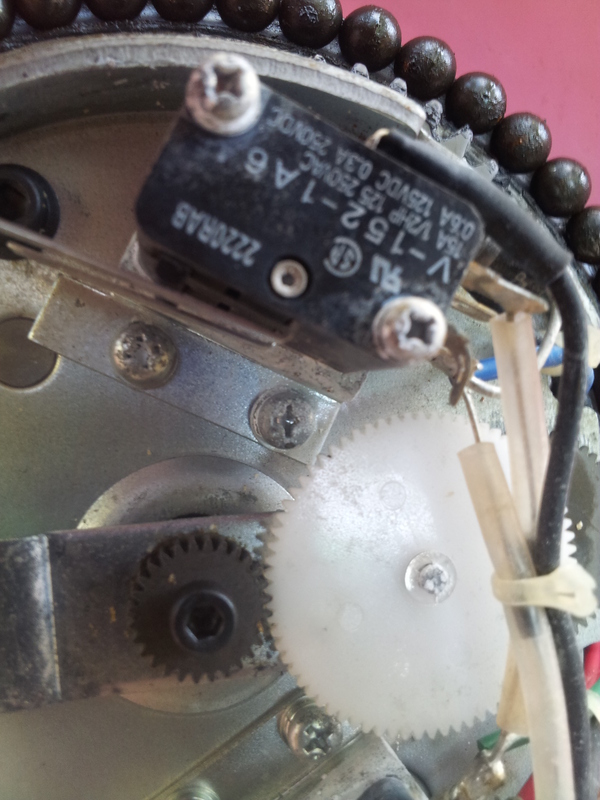 h) Take the cover cap off the rotor cable socket by unscrewing the cap if a cap is present. The cap and chain holding it can be left there to dangle. i) With the top-side-clam shell up, slowly lower the fixture that was held by the six bolts; this fixture is actually a circular metal piece with the six bolt holes and with A RACE FILLED WITH LOOSE BALL BEARINGS*. Lower this circular metal race fixture down to lay on the bottom of the tub, ball bearings up, and circling the rotor lower clam shell body. Then, carefully move the lower clam shell downward to rest in the bottom of the tub. j) Lift the top-side-clam shell up and off of the rotor. This exposes access to the two end-of-rotation limit switches on the freely rotating flange “tang” (that turns to switch either end-rotation stop functions) with the two upward extending finger stocks. 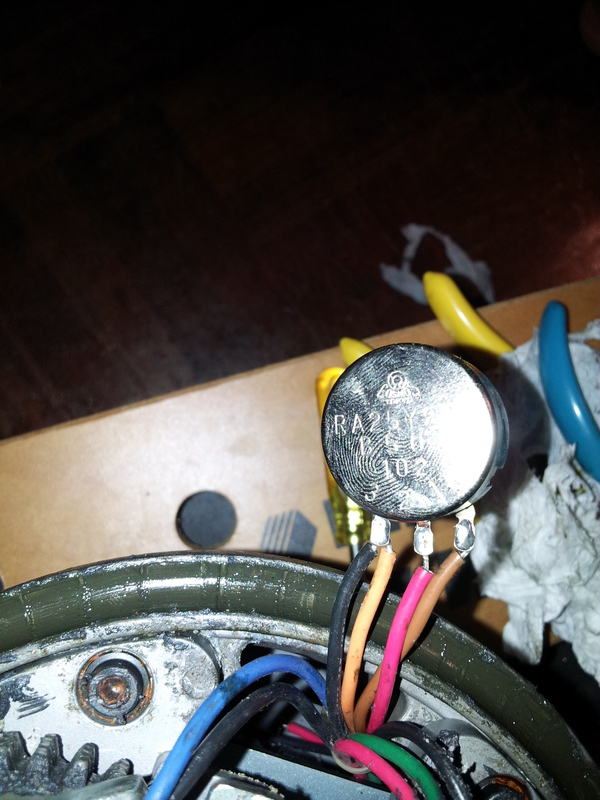 Note wire color on the pins on the potentiometer. Try to note the position of the rotating finger stock flange (“tang”), and keep it in this position always. There is a factory red mark** related to this flange (“tang”) position. j.a) If possible do not move the rotating finger stock flange (“tang”). Carefully put two masking tape pieces on each side of the rotating finger stock flange (“tang”) to record its position. Put this tape on the bare metal frame–same bare metal where the factory red mark** is. However, there is a correlation between 1.the placement of the “tang” and 2. the resistance value of the pot and 3. the position of the Upper clam shell relative to the “tang.” More below. j.c) Next, taking care not to move any rotational parts, measure resistances on the pot and good continuity contact on the other moving parts with a VOM. k.b) The “tang” moves freely, and if you lost its correct position when disassembling, you will have to run the rotor with the top clam shell on to discover where the “tang” should be. Hope someone will report which side of the “tang” should line up with the factory red mark** and include the resistance value of the pot and the proper alignment of the upper clam shell with the “tang” so all three work together when assembled. I WILL INSERT R VALUES SOON. SECTION ABOUT Removal of the pot positioning toothed cog wheels and the defective pot. 1. Pull DIRECTLY UP firmly the white nylon cog wheel, located above and driving the black metal cog wheel that is attached to the pot shaft. This is strangely a friction fit with no set screws. Put the gear in a safe place out-of-the-way. Note the wires that pass over the nylon cog wheel should be pushed aside and later repositioned so as not to touch the nylon cog wheel. 2. Locate and loosen the Allen set screw on the dark colored metal cog wheel that is attached to the pot shaft. The Allen set screw is in a collar under and attached to the dark colored metal cog wheel. NOTE! DO NOT remove the set screw, just loosen it. If it comes all the way out, it could fall below into the depths of the rotor; a very bad mistake requiring you to somehow invert the rotor and shake the lost set screw out. Pull directly upward on the loosened dark colored metal cog wheel. Remove the cog wheel, and put it out-of-the-way. NOTE… the top of this cog wheel and the top of the pot shaft may have some glue also holding in place, so some moderate force pulling upward may be needed. 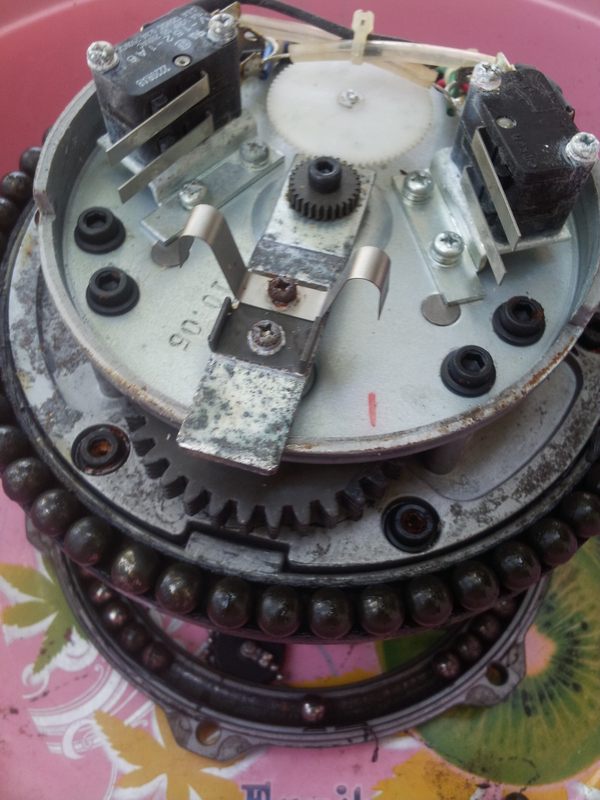 Once the cog wheels are removed, you can clearly see the pot and how it is mounted. 3. Step 2 above exposes the nut and washers securing the pot shaft to the rotor housing. 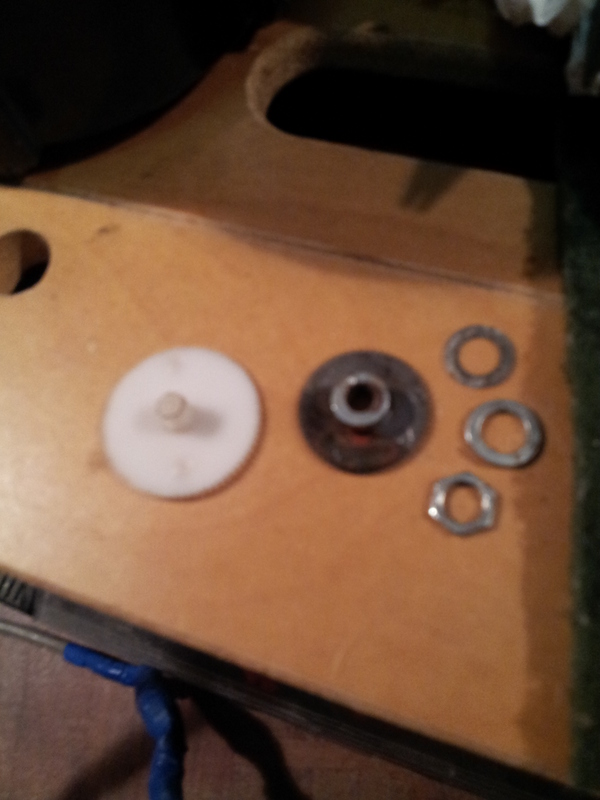 Unscrew the pot nut and washers which frees up the pot for removal. 4. Slide the pot out from the slot and take a color picture of the pot wiring and color of the wires. Remove the three wires noting which color goes to which pot lug. Take the old pot out, removing wires from its three contacts, and put it out of the way. 5. Install the new same-specification pot, from factory parts order or otherwise. Solder the the wires to their correct lugs. Slide the new pot into place and put on the washers and nut. Position the new pot as nearly to the old one position as possible. Try starting with the pot in approximately its center adjustment. The matter of the best adjustment value of the pot and the location of the “tang” was discovered by trial and error, running the rotor via the control box with the upper clam shell off and also in place. This step could be made easier by another person supplying specifics for the pot resistance setting and the other physical adjustments. UPDATE ON THIS COMING. 6. 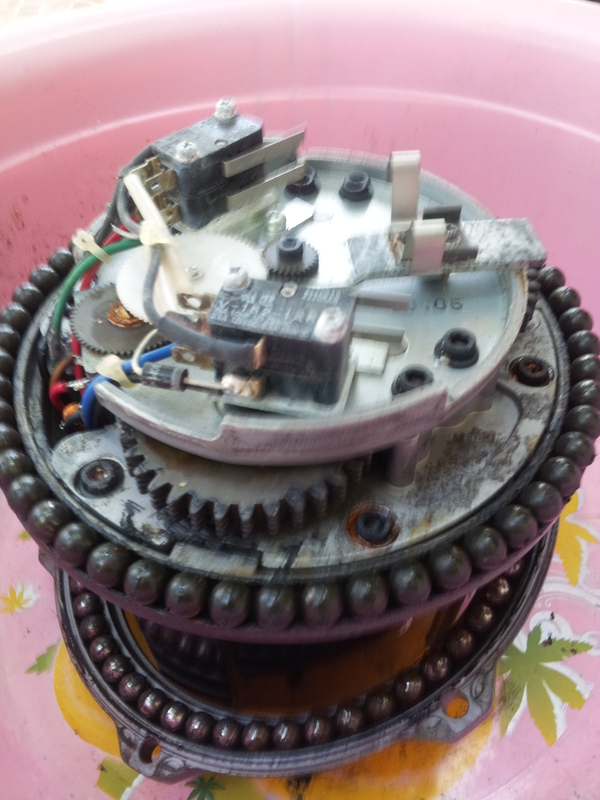 Re-install the dark colored cog wheel onto the shaft of the new pot. Tighten the set screw. Have the top of the dark colored metal cog wheel even with the top of the pot shaft. Duplicate the position of the old pot and cog wheel position. New glue here is likely not needed. 7. Push the white nylon cog wheel by finger pressure down onto its shaft and be sure its LOWER gear teeth mesh with the gear teeth on the dark colored metal cog wheel (the one with the set screw). All cog wheel teeth must mesh. 8. 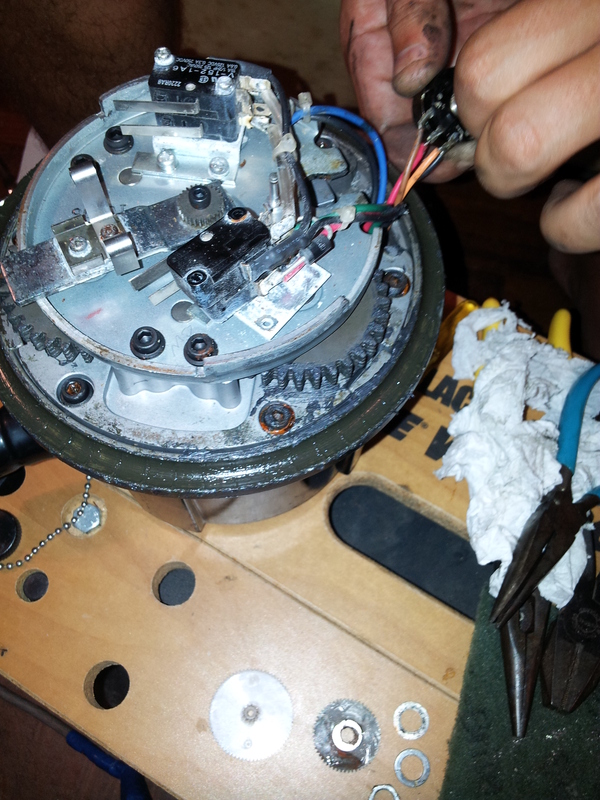 At this step, I did not need to remove the lower clam shell to inspect the rotor motor; my main message to the reader is about how to cope with the top clam shell disassembly/reassembly. 1. Carefully orient the bottom clam shell, with the rotor motor inside, UPWARD from the bottom of the tub and see that the ring of the lower bearing race (the metal circle with bolt holes and containing the ball bearings) remains on the tub bottom . 2. The finger stock end-of-rotation switcher (“tang”) with the finger stock should be placed exactly as it was when the upper clam was lifted off. Do not lose this position! Hope you marked the position and can leave it there during reassembly. The “tang” can move by itself (flop around), so dislodging it during reassembly is very easy, so be careful. If you lost the correct position of the “tang,” continue reading; do not despair. 3. Keeping all the ball bearings in their races, raise the metal circular race fixture upward (the piece that received the 6 bolts) to meet the upper clam shell. Place the top clam shell down over the assembly. 4. With the lower clam shell upward and the metal circular race fixture upward, align all three parts by tightly holding these three parts together to match your earlier marks. Hold by hand tightly. 5. Option one is to insert and hand tighten the bolts, inserted from below the rotor case; then turn the whole rotor over to wrench tighten the bolts. Option two is to HOLD the three parts together very tightly. Turn the whole rotor so the other end is UP. Insert the bolts and wrench -tighten them. Install the six bolts through the race circular fixture and into the threaded screw holes in the top clam shell, and tighten the bolts alternatively so that no one bolt is fully tightened until each is gradually tightened alternating from one bolt to the other. This helps get a balanced fit. a) Check the six bolts around the body of the rotor exterior to the tightness equal of the original tightness. Do not strip out the threads! b) Re-install the top mast clamps to the top of the upper clam shell. d)LATER, Some adjustment of the pots on the rear of the control box will be necessary, but if you positioned the “tang” correctly inside the rotor shells, this is not difficult. e) On the ground, test the directional accuracy of the rotor. If it is wrong, open the clam shells and re-adjust via trial and error. Have the control box fine adjusting controls on the rear of the box at mid scale, each, and trial and error will find their correct settings. MORE INFO ON THIS ASPECT IS COMING. e) Probably your marks on the rotor case and on the tower and rotor plate can be used to orient the rotor prior to bolting to the rotor plate. If in the trial and error adjustment phase, you moved away from this alignment, that is really no problem because you can hand-turn the mast and antennas to North prior to clamping the rotor clamps to the mast. This is the ultimate way to orient the antenna to match the control box indication. Be careful to provide enough coax loop to flex around the turning array, and remember the radius is 450 degrees total. f) The best way of putting rotor in the tower is to install the rotor and perhaps the GA-3000 tower torque absorber inside the tower with at least one thrust bearing above it (thrust bearing taking the downward load of the mast and array). With the mast inside the loosely bolted mast clamps on the rotor, hand rotate the mast and antennas to point North. Tighten the rotor mast clamp bolts, quantity 6. From the control box, turn the rotor and antenna to check if it points North and indicates North. Also turn the array clockwise on the control box all the way to the stop which should be beyond the South point and into the over rotating 450 degree feature for correct operation. If your ground testing has been good, the rotor should work ok.
g) You can correct the alignment between the antennas and the control box by turning the mast/antennas by hand with rotor mast clamp bolts loose. Use the adjusting screws on the rear of the control box for fine adjustments. *It is absolutely important to locate this rotor in a clean tub or large bowl prior to any disassembly because the numerous ball bearings in races (upper, middle, and lower) fall out easily. This advice can not be skipped unless one enjoys chasing dozens of small ball bearings over the floor. The races, balls, and lubricating grease can be inspected during this service of the rotor. The balls and races should be clean and covered with a light lubricant. The factory recommends Valvoline DuraBlend Synthetic Part# VV278. 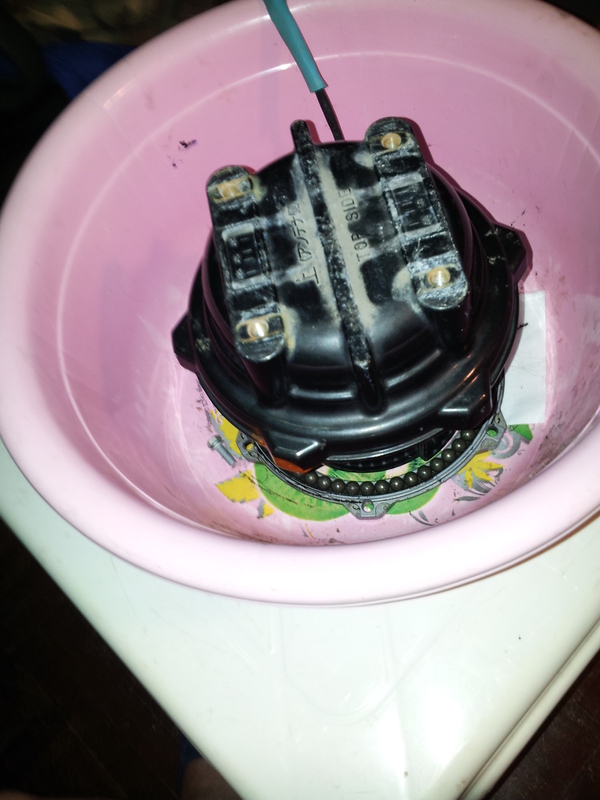 My rotor did not require new lubricant, but several of the ball bearings fell out of their race and into my tub. Note that this new rotor, never opened before, had enough ball bearings so that all were touching each other; there is no empty space between any of the balls! It is not advised to position, and certainly not to operate, this rotor in any position other than vertical with the top upward. The flange (tang) with the finger stock (described above in III. j and IV.b) “may” become incorrectly oriented if the rotor is operated lying on its side. -I disagree with W9JCC about handling and installing this rotor in any orientation other than straight up with top point up. Thus, this document makes that “upright” assumption. W9JCC ‘s good advice is incorporated in this document but his unique sideways handling and mounting method is only in HIS document. Thanks to OM Frank for his extensive input. His situation involves a tilt-over tower and deserves consulting. -Swen, HS0ZFZ, worked tirelessly during our trial and error phase and made the difference in success. Thanks OM. – W1WEF has published information about the Yaesu G-1000SDX disassembly, w1wef@snet.net. -The Yaesu GA-3000 “tower torque absorber” is made of two strong plates of metal sandwiching in between a block of hard “rubber” substance. The rubber provides some flexing between the rotor and the tower to ease the shock of starts and stops on the whole system. Its usefulness can be judged by the installer, but in my large array, it does allow a more even turning due to some flex in the alignment of rotor, mast, tower, thrust bearings, and the yagis, especially under wind loading. However, the rubber will eventually deteriorate and require scrutiny during regular tower inspection. Observe that the GA-3000 would require significant adapting and drilling to use with the HyGain line of rotors such as the TailTwister. I live in Thailand. I welcome questions and comments on this rotor via email (hs0zcw@gmail.com) or by Skype voice. Good luck ! Nice job Charles! Just started digging into a used G-2800DXA I got from a friend.